Have you signed up for a webinar yet? Has your business held a webinar? If not, you may be missing out on one of the most valuable uses of the Internet. A low-cost way to hold informative seminars with experts, webinars or online seminars, provide a way for people across the country to dial in and watch your expertise from their computer screen. 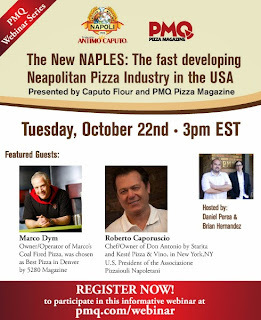 PMQ is hosting a webinar with Caputo Flour next Tuesday at 3 p.m. You can register today to experience the event at pmq.com/webinar. Webinars can also be a useful training tool for your company. Do you have an idea you want to expand upon for several of your stores? Why not address them all at one time through a webinar? What is your topic that you have expertise of or have guest experts that you can invite to discuss? Take for example the above picture. 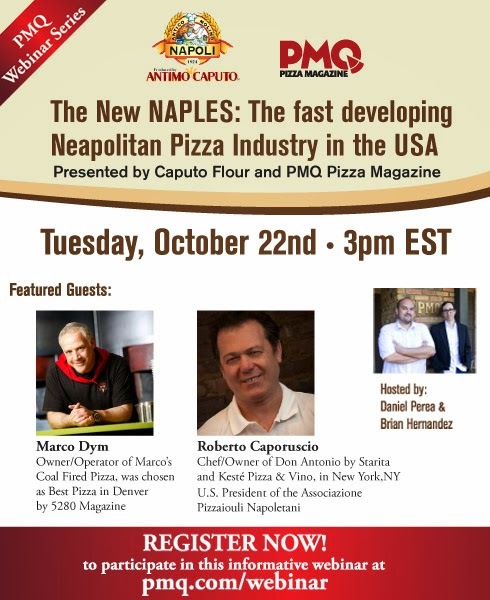 PMQ and Caputo Flour are bringing in experts to talk about the Neapolitan style pizza because it is the fastest growing style in the U.S.
Make sure you have someone to organize the event, someone to speak and someone to deal with technical issues throughout the webinar. Will you have one speaker talking, a group discussion, an interview style or an interactive style with the members signed up for the webinar (accepting questions). Slides introducing the topic, showcasing specific items or websites or other tools to highlight what you are talking about are useful. This should be free to your participants or as low-cost as possible. Your costs are also somewhat minimal, ranging from recording the webinar to sound equipment or telephone systems. There are a variety of systems to use. Check out this top ten review of the main webinar programs. PMQ is using gotowebinar so you can sign up with our webinar next Tuesday to experience one system at pmq.com/webinar. This should come with the system you select. For your participants, it is good to provide both the headset option where they can listen in or a telephone option where they can call in. If your webinar is at 3 p.m. be prepared to have introductions by 3:01 and introductory information by 3:05. Schedule out each minute of the event. Schedule a dry run with the staff members and speakers. Make sure to get out as many ticks as possible before your crowd calls in. Give yourself a few days to do this. Every way you can reach potential subscribers, do it. Social media is one way. Flyers at your pizzeria, cross-promotions with others doing webinars, online ads, press release out to bloggers and media that are interested in your topic, newsletters and more. What way do you get people to sign up to your webinar?